The Fifth Crusade (1217–1221) was an attempt to take back Jerusalem and the rest of the Holy Land by first conquering the powerful Ayyubid state in Egypt. Pope Honorius III organized crusading armies led by Leopold VI of Austria and Andrew II of Hungary, and a foray against Jerusalem ultimately left the city in Muslim hands. Later in 1218, a German army led by Oliver of Cologne, and a mixed army of Dutch, Flemish and Frisian soldiers led by William I, Count of Holland arrived. 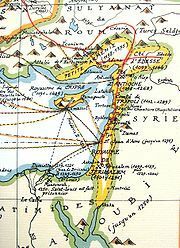 In order to attack Damietta in Egypt, they allied with the Seljuk Sultanate of Rûm in Anatolia, who attacked the Ayyubids in Syria in an attempt to free the Crusaders from fighting on two fronts. After occupying the port of Damietta, the Crusaders marched south towards Cairo in July of 1221, but were turned back after their dwindling supplies led to a forced retreat. A nighttime attack by Sultan Al-Kamil resulted in a great number of crusader losses, and eventually in the surrender of the army. Al-Kamil agreed to an eight-year peace agreement with Europe. By processions, prayers, and preaching, the Church attempted to set another crusade afoot, and the Fourth Council of the Lateran (1215) formulated a plan for the recovery of the Holy Land. In the first phase, a crusading force from Austria and Hungary joined the forces of the king of Jerusalem and the prince of Antioch to take back Jerusalem. In the second phase, crusader forces achieved a remarkable feat in the capture of Damietta in Egypt in 1219, but under the urgent insistence of the papal legate, Pelagius, they then launched a foolhardy attack on Cairo in July of 1221. The crusaders were turned back after their dwindling supplies led to a forced retreat. A night-time attack by the ruler of Egypt, the powerful Sultan Al-Kamil, resulted in a great number of crusader losses and eventually in the surrender of the army. Al-Kamil agreed to an eight-year peace agreement with Europe.